The name of the dashing green fellow in the picture to the right is South. He and a bunch of his friends showed up at a game of The One Ring that I ran at Origins this year. South showed up just like this, in full Orc makeup from a larp he was involved with earlier. Joking around, he played up his Orcish character and joked around with the other players both known and unknown to him. As I went around the table and gauged my audience, I asked two questions. How familiar are you with The One Ring and what games do you usually play? Player A: Somewhat. I usually play pathfinder. Player B: Not at all. Pathfinder. Player C: I run pathfinder for these two. Thought this looked ineresting. Player D: I’ve played in it in a home game. Player E: I run it at home. South: I’ve played it and really like it. Ok, cool. What did everyone come here for? Do you like Tolkien? Do you read the books, watch the movies? Player A: I watch the movies. Player B: Movies, read the Hobbit. Player C: I’ve read a bit and love the movies. Player D: I love Tolkien! I’ve read everything. Player E: I read a fair amount, but I’m not going to call you on not getting names right. South: <In a gruff voice> I came here to kill humans and eat hobbits! Me: Step into my office for a minute. I pulled South over and asked him how well he knew the system and if he wanted to make this a PVP game. I’d run the narrative and he would play out the BBEG and a few key underlings, running the combat with prompts from me. I’d cover his game cost and he would get to keep acting in character. He jumped at the chance and we ran the game together. The other players bought in and were looking forward to taking on their friend in the game but not seeing him as the Game Master. For my part, I modified the story greatly and on the fly. I added a monster character based on what South said he would like to play and he on the fly fleshed out the Mountain Troll Tuskmaw, asleep for hundreds of years and just now awakened to terrorize the Riders of Rohan. He controlled Tuskmaw in the introductory flashback that the players retold/played in to get used to the system. The game started at a feasting house, drinking and recounting the tale that brought them to the Thengel’s table. Then, he played the lieutenant’s of Tuskmaw, goblins on Wargs, the leader of the savage tribe Wulf, one of the PCs, had to wrestle to gain favor from and make a peace deal with, and finally came back to playing Tuskmaw for the final, epic battle. I ran the narratives and prompted him on what to prepare and expect. He pawed through the monster stats and used his focused attention to use the monsters to their utmost ability, making sure the Fear effects and points were used appropriately and readily. These were things I would have forgotten about while trying to navigate all the other enemies and move the story into the next arc. The other players rose to the challenge, doing epic things in combat and the narrative elements. They seemed to rise to the challenge and want to be as awesome and epic as South was playing up his characters. I got to maintain my neutral position as the Game Master and story moderator, handling the other situations and letting the players focus on their enemy who was suddenly alive and in green – Tuskmaw. The game ended with the climactic killing of Tuskmaw by Wulf the barbarian, wielding a spear whose blade was stained with the blood of a creature of darkness. The group let out a huge sigh, everyone had a great time and South gave a meaningful death speech in character. 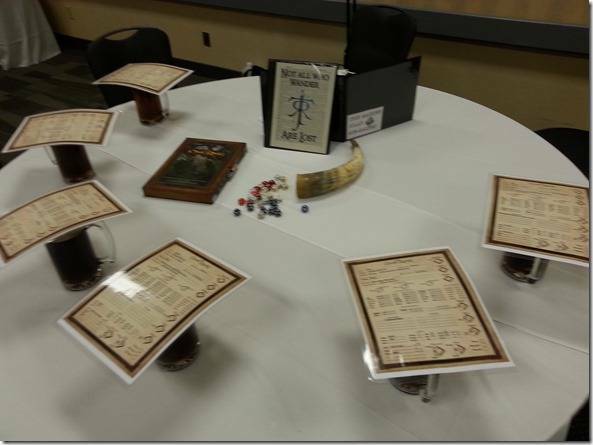 This experience reinforced a few key ideas that I have about GMing. If I hadn’t been open to these concepts, the game would have been good, but not the epic masterpiece it became. Always be willing to modify things on the fly, based on what the players bring to the table. Whatever you’ve got written down and ready to go pales in comparison to what is happening in front of you at the table. Telling your players you are winging it rarely raises any ire or annoyance, and players have more fun knowing their choices matter. [pullquoteright] Be willing to ditch whatever you’ve got planned to follow up on one of those “Gift Orcs” and make the game super epic. [social_warfare] [/pullquoteright]If you’re ever approached with a situation like this, run with it. If a player brings props to emphasize an aspect of their character, make those props super important to your story. If the players try to gain entrance to an auction by declaring war in the name of the Elven kingdom, let them make their roll and go with it. Never look a gift Orc in the mouth, no matter what form it takes. Players always have tells about what they find important and fun, even if they aren’t as obvious as showing up in green makeup. Be willing to ditch whatever you’ve got planned to follow up on one of those “Gift Orcs” and make the game super epic. The Epic heroes and vanquished villain post-game. 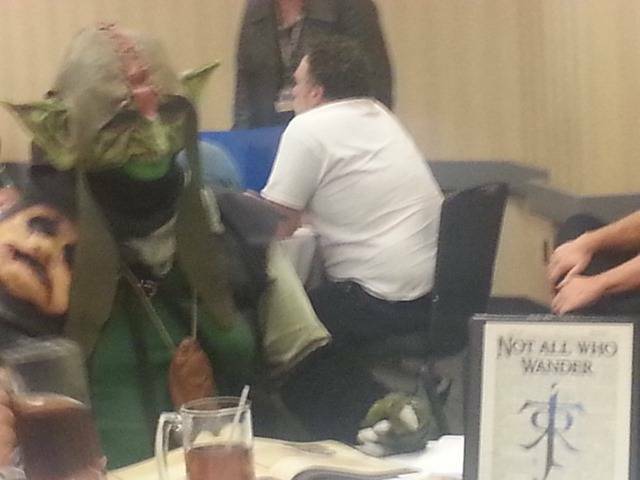 Have you ever had a “Gift Orc” show up to a game? What form did it take? How did you incorporate it? What tells do you have that are “Gift Orcs” when you are a player? Lol. Thank you for the compliment. I am full of Gnomish blush. In reality, all hail South for being willing to jump in and try something different and the other players to roll with it. This game was one of the best collaborative games I’ve ever run. The players had a different focus because the person running combats was someone they truly wanted to beat, while the person adjudicating the world was just there to facilitate the story. South could play the villain as strong as he wanted while I could make sure the game remained fun, balanced, and narratively intersting. It sounds like it worked out great with South. I never would have thought about PvP, given bad experiences when it’s come out sideways from a game not built around it–I’m glad you did. It sounds like it worked out very well. From what John had stated though, he wasn’t an Unprepared GM. Obviously he did some prep and had done enough to be able to make some on the fly decisions without confusing the game or causing unwanted noise. Awesome Job and I may consider running the next couple games in a similar way, with another ‘player’ controlling the bad guys. I like the possibilities that arise. In terms of what “Gift Orc” tells I have, I try to help move along most combats, taking initiative’s placing and moving mini’s (if any) helping the GM keep track of who got hit and by how much. I know from running games that every little thing that can be delegated is helpful not just to the GM, but every player in speeding the game up in terms of pace and makes everyone feel involved and ‘doing’ something when it’s not their turns. Yeah, I was running from an adventure from the company and it was the 5th time I’d run that adventure that convention. I just decided to ditch the intended story to make sure that there were elements that played to what the players seemed to like in that moment. I love it when my players move stuff around for me so I can keep track of less. In many games I don’t run anything strict to a 5 ft grid, so there is little chance for misinterpreting where I intended the bad guys to move. Even if a player moves it wrong, that gives me a hint to their interpretation of the scene from their end of the table. I agree, Scott, that doing a traditional PVP would have been interesting. South was running enemies from the book and expected/knew they were going to get defeated. He bought into the aspect of the GM that favors story over mechanics. He’d GM’d before, so it was co-gming in some senses. He just ran the combats straight with no fudging or deciding to not target the about to die PC. He ws fairly brutal. Thinking about that more, Scott, I could definitely see some trepidation if I were a player walking up to the table and the GM pitched me the idea of running the combats in a pvp-ish style. I’d have to feel that the GM wasn’t unprepared, but was doing something interesting. I’d probably be more comfortable with a GM that I’d played with before. I love this story. 🙂 It’s great that you recognized the opportunity and that he was willing to jump right in head first. Not quite the same, but once when I was running Doctor Who, the PCs were chasing a series of time rifts appearing around the city. At one point, the ex-time agent (that had lost his vortex manipulator to a hot red head in the background) turned to me and gasped, “Oh no! Could these rifts be caused by someone using my vortex manipulator wrong?! ?” I paused for half a second and said, “Yes, yes they could.” It suddenly changed what was going on the game, but it was so worth it. And that’s why I love playing in games you run. I almost had that dinosaur in the dumpster as a pet, the dice just betrayed me!!!! Bugger! I want to be in this game in my next life. Thanks for the inspiration; in our latest session of Marvel Supers I was about to run a session very heavily inspired by the back story of one of the PCs. 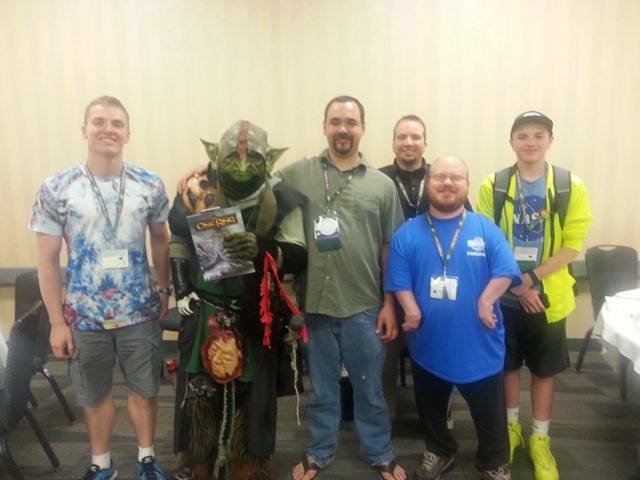 Thanks to reading this article however I recognized my ‘Gift Orc’ opportunity and asked the player to run that session instead. Not only did he do a great job, I picked up a few tips on things I can do better. I have also had one other player come up to me and ask if he can run a session some time (YES!! very much yes! ) and I suspect at least one or two other players are thinking of running scenes for their characters ‘background disclosure issues’. When the write up is done I will post the link to our game session for anyone who is interested to see how this worked out. I would be interested to learn if anyone can spot the change in GM style from the writes ups, though keep in in the write ups are done by different people each week. finally got a few write-ups for those who are interested to compare. the link leads to the session run by my ‘gift orc’ aka Stealth.